Argent Silversmith is an Australian jewellery brand that takes personal to the next level—its founder sees through every part of the creation process. Liz Herman hand-makes every single piece of jewellery, drawing inspiration from her natural surroundings and designing the simplistic yet timeless pieces you see on the Argent website. Even though Liz crafts her beautiful jewellery while she travels the globe, her main base is in Falls Creek, Australia. Her surroundings inspire the ideas that become the jewellery designs, with the Australian Alps being the main concept behind her vision. She also adds in elements of the ocean and the places she has been lucky enough to travel, and this collaboration between her mind and her journeys is shown through the different Argent Silversmith collections. Ethical production is at the forefront of Liz’s mind when she sources her materials. The metals she uses are not only recycled but are also of Australian origin (kudos to Liz for keeping it local), and the wood is reclaimed from Blackwood and Red Ironbark offcuts. Even the pearls and opals encased in her jewellery are carefully chosen because of the way in which they were sourced; either being repurposed from necklaces or obtained sustainably from Australian mines. A commitment to both reducing waste and minimising their carbon output is at the core of Argent’s production process. The packaging you will receive your Argent goodies in is made to be reused or recycled, and you can even choose between compostable or reusable/degradable/recyclable packaging, depending on what is the best fit for you. The renewable energy powered studio in which the jewellery is made uses the least amount of electricity and gas as possible, and their carbon footprint is calculated in order to offset it to various rewilding and reforestation programmes. It’s also just an awesome feeling being able to tell someone the process behind the ring or necklace they’ve just complimented, the values at the core of the brand that piece of jewellery belongs to and the effort that has gone into its ethical production. We’ve even partnered with Argent to give you guys a discount code! We make absolutely nothing off of this; it’s purely because we love you guys so much and appreciate you opening your mind to a more conscious way of living. 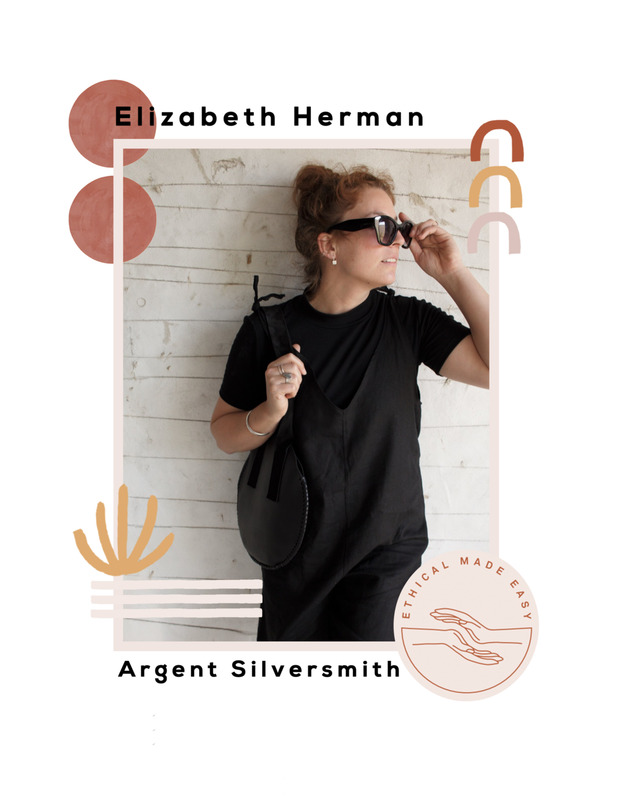 An interview with Elizabeth Herman, the founder of Argent Silversmith. What made you start Argent Silversmith? I discovered the art of silversmithing through a friend and was immediately hooked. Working metal with my hands (and an array of specific tools of course) made it possible to create any piece of jewellery and my imagination was the limit. I bought the tools I needed and stumbled upon a little suitcase filled with antique silversmithing tools, designs and offcuts, purchased recycled silver wire and sheet and started creating. 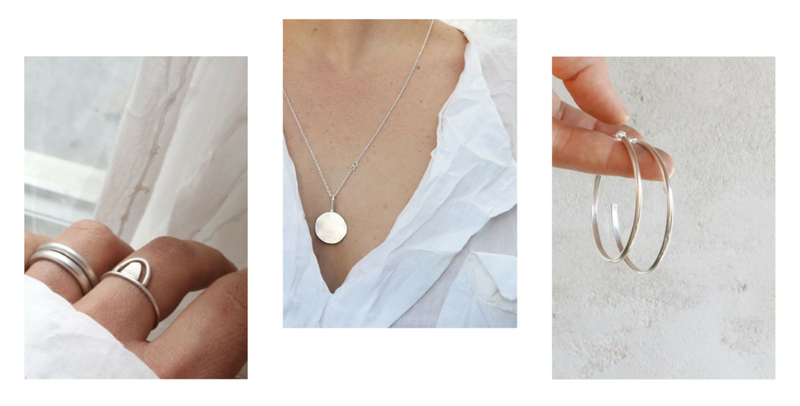 Argent Silversmith was created a few months later, when I realised that the pieces I imagined and loved to wear were also loved and worn by the wonderful people around me. I think creating an ethical business requires dedication and a real passion for the product you are selling. Most of the ethical businesses I know and love all seem to pour everything they have into their label, ensuring every aspect of it is perfect, from the sourcing of materials, to creating the product, to presenting and marketing it. Personally, I have found it difficult to find the balance between pushing people to consume and advertising my label - I have had valuable feedback from promoters of ethical fashion who have made me realise it is a fine line and marketing is necessary for any business to survive. This can be done through ethical channels though, like sustainable and ethical blogs, magazines, reaching audiences who are actually looking for an ethical product, and organically (word of mouth, pop ups, attending markets, etc). I don't think I realised how much was involved in running a business. Of course there is the creation of the product, which for me is always the most important part—knowing I have made every single piece and that each and every one is unique—but then there is everything else. I have become a website designer, a product and model photographer, a hand model, a master of Instagram and Facebook, an expert in postage and handling, have budding skills in administration and tax return, a market stall carpenter and painter, a novice public relations specialist, a graphic designer and a web researcher, amongst others. Although time management is challenging (especially with a full time job), I have learnt so much since starting Argent that I appreciate every second of. Within the ethical fashion community, there's a big question that we ask which is 'who made my clothes?'. In the scope of Argent Silversmith, who made your jewellery? I did. I always have and I always will. I understand the difficulty of applying this rule to clothing but I believe as long as the people involved in the creative process are treated fairly and ethically and love the product they are making, it is not an issue. Make what you love. At times, it is tempting to make what the market wants, what the people want, but I think as long as you create the pieces that you love, not what you think other people will love, then your label will never lose its uniqueness, its raw beauty. Ensure it is ethical and sustainable from the start. I believe my jewellery has always been ethically sourced (the silver and gold is recycled in Australia and the stones/pearls are ethically sourced or reused from old necklaces) and created but I am currently trying to become waste-free and fully sustainable, which is more challenging once you have already started and your business is running smoothly. Implementing sustainable practices from the start would have been much easier than trying to change the process further down the track. Where do you envision Argent in the future? Ideally to be as ethical, sustainable and waste-free as can be. This will require some work and time but it is definitely possible. My tireless imagination, my love for creating and the way people connect with my jewellery. I have been so fortunate to have started my label in a supportive community of incredible, loving people who have been so encouraging over the last few years and have kept me inspired and motivated even when running a business has been at its most challenging. At the moment I am based in Sri Lanka so my morning routine is quite idyllic: wake up at 5.30 and go for a surf for an hour or two (I am only learning so by surf, I mean mostly face planting waves), then have a coffee with my toes in the sand and a tropical fruit breakfast. I then answer emails and post on Instagram before starting to work on some jewellery. I generally love making a new piece I have been thinking about or have sketched first to get my creativity flowing and then work on my orders. The Alchemist by Paolo Coelho. It's probably a bit cliché but I always have this book in the back of my mind and try to be mindful and grateful for every aspect of my life and where it is at the moment. I have been following the @ecowarriorprincess on Instagram and always get great inspiration and motivation from her posts. She also always answers messages with insightful advice. Salt Gypsy is one of my favourites. I love the way they've ensured every aspect of their label is ethical and sustainable in a beautiful, simple way.